A 60-foot Kermit the Frog helium balloon will be appearing in the Kentucky Derby Festival "Pegasus Parade" in Louisville, Kentucky. Parade time is 5:00 PM on Thursday, May 4, 2006. The Pegasus Parade is a major part of the month-long festival which leads up to the famous Kentucky Derby horse race. The 2006 parade theme is "Once Upon A Toy" and will feature 10 balloons, 13 marching bands and dozens of other floats and equestrian units. This is the parade's 51st year and average attendance along the parade route is 250,000. Live television coverage is provided in the Louisville area by WAVE 3 TV. 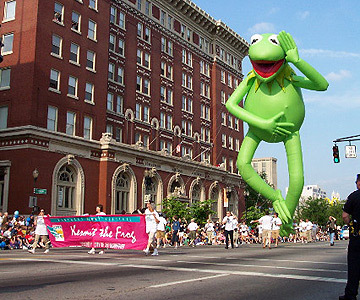 The Kermit balloon is provided by Dynamic Displays (www.fabulousinflatables.com) which holds licensing rights to Kermit and several other Henson characters. The balloon is similar in size and appearance to the balloon which has appeared in the Macy's Thanksgiving Day Parade, although a Dynamic Displays spokesperson said this is not the same balloon. You can view photos of Dynamic Displays' many other balloons including Miss Piggy, Animal and Bear on this page (although those are not scheduled to appear in the Pegasus Parade). For more details about the Kentucky Derby Festival Pegasus Parade details, visit www.kdf.org.